Action Color Picker | Appracatappra, LLC. Action Color Picker provides a highly customizable, cross platform graphical color selection system for iOS and Android. With Action Color Picker you can present the user with the currently selected color, allow them to select the desired hue, then change the saturation and brightness of that hue, all with a minimum of code. Action Color Picker provides functions to move easily between the HSV, RGB and native UIColor (iOS) and Color (Android) spaces. In many cases the same code used to work with an Action Color Picker on one platform can be used virtually unchanged on another which not only saves time, but improves code maintainability. The Action Color Picker is actually a suite of several individual components that can be added to your iOS or Android apps to provide a wide range of color selection interfaces. Because of this flexibility, you can use the individual components of the suite to tailor the color selection UI to your app’s look and feel. The following sections will define the individual components of the Action Color Picker and how they can be used within your apps. 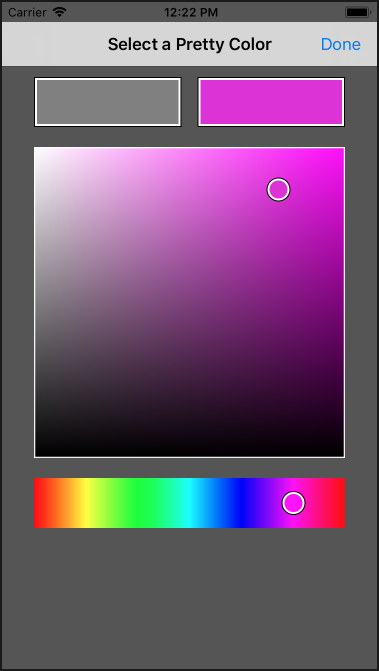 This control is typically used with an Action Hue Bar (ACHueBar) to select the initial color Hue. The ACColorWell is typically used along with the ACHueBar and ACColorCube controls and can be any size inside of the UI. The ACHueBar is typically used with the ACColorCube and ACColorWell to form a fully color setting UI. When added to an app’s UI, the ACHueBar needs to be set to 256 pixels wide by 50 pixels high. Defines a color as its Hue, Saturation and Value properties and contains utilities to move the color to and from other color spaces such as UIColor (iOS) or Color (Android). 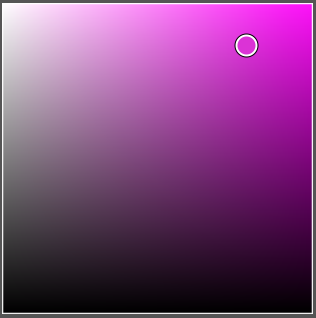 The HSVImage class creates the HSV images to present in the ACColorCube and ACHueBar based on the current Hue, Saturation and Value properties. Represents a color based on its Red, Green and Blue properties and contains the properties and methods to convert the color to a different color space, such as UIColor (iOS) or Color (Android).